Over the coming months, Hodan, Fartousa, Kayf and Diane are creating study guides for teachers and youth to accompany our documentary and some of the YouTube videos produced by Specs and Veil Productions. 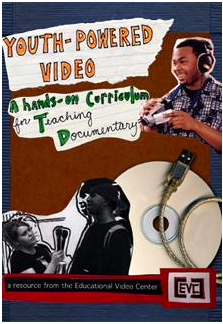 We hope this will encourage teachers to bring new perspectives into the classroom related to female youth from marginalized communities and the possibilities of media making in the digital age. B) Video: Kayf and Hodan offer advice for teachers interested in doing video production with their students. 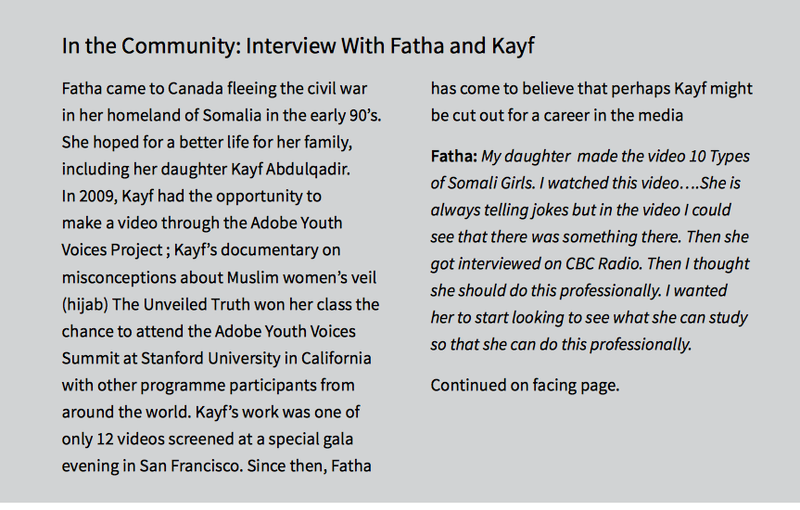 Kayf Abdualqadir and Hodan Hulajeh are award-winning YouTubers from the Somali-Canadian community. In this video they discuss their perspectives on how teachers on students might engage media production in the digital classroom. This video has been created to engage youth and teachers in conversations related to new literacy practices taking place in and out of school. 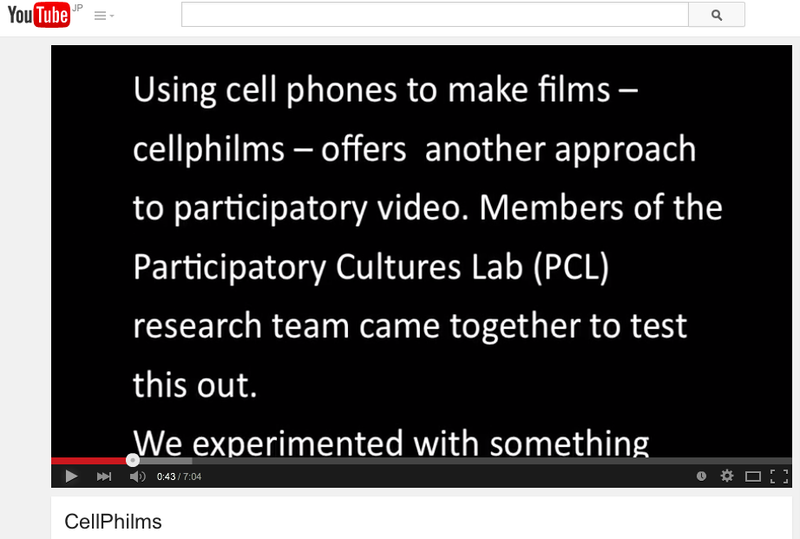 Watch this video on YouTube to find out more about another approach to participatory video for teachers and youth. Muslimah Media Watch is a forum where we, as Muslim women, can critique how our images appear in the media and popular culture. Although we are of different nationalities, sects, races, etc., we have something important in common: we’re tired of seeing ourselves portrayed by the media in ways that are one-dimensional and misleading. This is a space where, from a Muslim feminist perspective, we can speak up for ourselves. As Muslim feminists we aim to locate and critique misogyny, sexism, patriarchy, Islamophobia, racism, and xenophobia as they affect Muslim women. Furthermore, we believe in equal opportunities, equal respect, equal freedom, and equal value — regardless of gender, race, ethnicity, sexual orientation, nationality, religion, and ability. This blog is meant to be inclusive to all people, with a special focus on Muslim women. MMW strives to create an environment in which our writers and readers feel safe and welcome. We ask that you be considerate towards others and their opinions. This is a respectful forum for dialogue, not argument or personal attacks. MMW was founded by Fatemeh Fakhraie in the fall of 2007. Krista Riley has been Editor-in-Chief of MMW since the fall of 2011. This module applies a critical lens to existing multicultural discussions about diversity and difference. It does so by situating these discussions in an anti-racism/anti-Islamophobia educational framework that provides the pedagogical foundation for the other modules in this tool kit. This module contains three lists of recommended books, both fiction and non-fiction, that focus on the lives of Muslim women. The women represented come from a range of backgrounds, ages, time periods, and relationships to Islam. None of these works should be taken as representative of Muslim women as a whole, but all offer interesting starting points for discussion and learning. The books challenge the stereotypes of Muslim girls and women as passive, obedient, and/or exotic. This unit shows how the hijab has multiple meanings that can change over time and in different contexts. It shows examples of the hijab in historical contexts as a focus and symbol of colonial attraction, of post-colonial and revolutionary protest, and of religious and national banishment. It presents visual images and related information to address why certain images continue to circulate. The unit also examines the marketing of these images in advertising and pop culture. 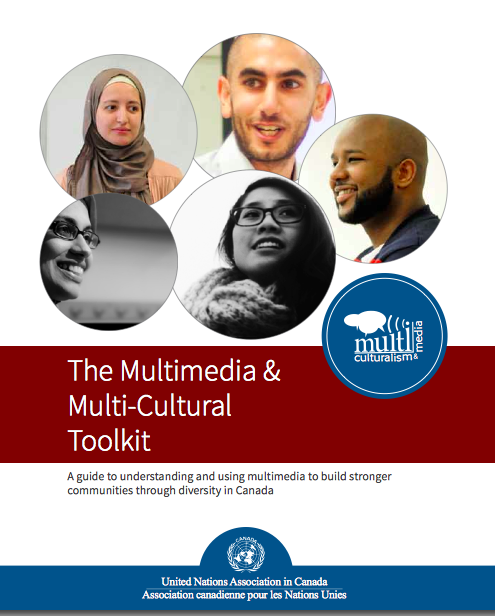 A guide to understanding and using multimedia to build stronger communities through diversity in Canada. 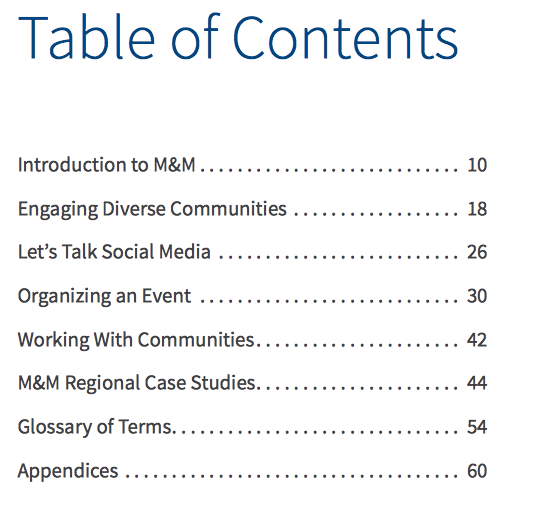 This guide contains valuable information and tips on how to engage your community in learning about the power of the media to transform Canadians’ perceptions.The M&M programme was developed by UNA-Canada to raise awareness of the need for inclusive inclusive media representation of all communities in Canada, and break down barriers to full participation and contribution by youth from ethno-cultural minority communities to media across the country.